Among my favorite books are ones about survivors of the Holocaust. I hadn't heard about refugees fleeing to Shanghai before so I was anxious to read this book. I had a friend of Dutch/Jewish descent who was in Auschwitz and who escaped and survived. Her stories were horrific and have never left my mind. 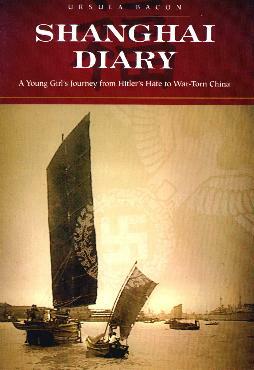 As a child, Ursula Bacon and her family went to China to escape Nazi Germany in 1939 where they remained until 1947. They were among 20,000 Middle European refugees fleeing for their lives. She recalls their impoverished existence in their new home and also the variety of people they met. All very fascinating and mind-blowingly graphic. I wonder how many modern day kids would cope with such contrasting circumstances. The hardships they had to endure were in such contrast from what they were used to in Germany, and their belief that a life in America existed at the end of the war, kept them going. War is gruesome and often brings out the best and worst in people, both the warriors and the civilians. War changes people. Ms. Bacon's account of her childhood experiences are vivid and nauseating, yet optimistic and often upbeat. I could feel her heart throughout this book. I didn't want her book to conclude as I so wanted to learn about her life in America. However, it was a pleasing ending. See my review of Ms. Bacon's other book, The Nervous Hostess Cookbook. Conclusion - A wonderfully illuminating book - one everybody should read.